Who is Bob, anyway? And what does he do? First and foremost, I'm an Atari user, just like you. I've been an Atari user for some six years now, starting with an Atari 400, which I still have. My first ST was a 1040ST color system with a 30MB hard disk. I'm presently working on a Mega STE. I've been involved with user groups for almost the entire time that I've had an Atari computer. After I bought an 800XL and a 1050 disk drive, I started looking for a local user group. I found a book entitled How to Get Free Software for Your Atari Computer that listed user groups across the United States. That list included the Atari Computer Association of Orange County, the group that I ultimately joined. Within a year I was the disk librarian for our group, and the following year I became the president. I was starting my third term as president when I was hired by Atari Corp. In my role as manager of User Group Services, I travel extensively. In 1990 1 logged over 60,000 miles visiting user groups and attending shows. I am very active online on GEnie, Atari's official online network. 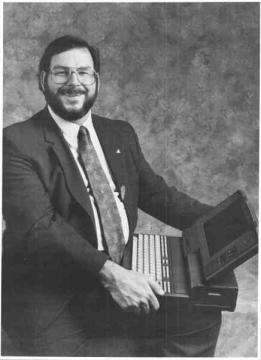 I have just been assigned to be the moderator on BIX for the Atari ST conference, and I also maintain an account on CompuServe. In fact, getting in contact with me is best done via E-mail on GEnie. My electronic mail addresses are BOB-BRODIE on GEnie; 70007,3240 on CompuServe; and BOB.BRODIE on BIX. Some of the things I'll he doing in my monthly column in START is letting you know about some of the things Atari is doing, squelching a few rumors and answering your questions. If you have anything you'd like to ask me about, please write mc directly at Atari. My address is: Atari Computer Corp., 1196 Borregas Ave., Sunnyvale, CA 94089; Attn: Bob Brodie, Manager of User Group Services. While I can't respond to all letters, I will do the best that I can. The ones that appear to be the most interesting will be printed in START. Our first letter comes from Joseph M. Klein of New York. He asks "Why do hard disks for the ST seem to cost so much? A typical 20MB hard disk costs around $250 for an IBM compatible. The ones for the ST seem to cost hundreds of dollars more. What ever happened to 'Power without the Price'?" Our friend from New York asks a good question. However, if you compare external hard-disk mechanisms, you will find the ones for the ST are still pretty competitive. The real key is the fact that on the 520ST/l040ST/ I040STE there is no room for an internal hard disk to he readily added. If you were to check the pricing for external hard disks on the Mac or the Amiga, you would find that their pricing is typically more expensive than on the Atari ST. Here's where the money for an external hard drive is spent. Usually, the box-style cases of the IBM compatibles have a lot of room inside for additional equipment, like hard disks. Most of them come with a power supply that can handle the extra load of a hard disk, but that will no doubt vary from case to case. External hard drives have to supply their own power, hence the added cost. Figure at least $75 for a good-quality power supply. Pricing on a case can run from $50 on up, depending on the size and type of the case. Pricing on a case also depends a great deal on how the case is configured. Do you just want a "shoebox" type of case, just enough to get by with? Or do you want to go whole hog and remount your entire system in a single tower-style case? One of my friends showed me a really neat tower case at the last Southern California Atari Faire. It would have let mc remount virtually my entire system inside it. It had mounting brackets for up to four hard disks, two Syquest removable hard drives and two floppy drives, a spot to mount the motherboard, a fan for cooling everything, and a really big power supply. The case alone was $275. If you don't get fancy, figure $100 for the case. Next, you will need a host adaptor to use the SCSI hard disks with your ST. These devices are not sold directly by Atari, as they consider them to be an integral part of their hard disks. However, at least two other companies, Supra and ICD, do sell them. Both companies include their own hard-disk software, consisting of formatting software, boot software and other hard disk utilities. Retail cost for these host adapters is typically in the $100 range. Then, of course, there is the question of the hard-disk drive itself. Hard disks come in a number of different types. There are units that require a hard-disk controller, others that come with a controller built in (SCSI embedded drives). Physically, they come in full-height units, half-height units, 5.25-inch size and 3.5-inch size. Prices on hard disks depend on these factors. In other words, a physically large, slow hard disk with small storage capacity will cost much less than a physically small, high-storage, fast hard disk. Assuming that the type of hard drive is similar, the extra expense of an external Atari hard drive versus an internal IBM-compatible drive comes from the external-drive components: the case, power supply and host adapter. These push up the price about $275. However, this is like comparing apples and oranges. If you truly want to compare Atari versus IBM prices, use the price for an IBM-compatible external drive. You'll find that Atari is competitive with IBM. Of course, if you're familiar with electronics, and know what you're doing, you might want to put together your own hard-disk system. Clearly, you can save some money this way, plus have your system exactly the way that you want it to be. If you're not up to the task all by yourself, there are alternatives. Check with your local user group. Quite often there will be someone who can help you, or might do it for a fee. User groups can also point you to a reliable source that does this type of hardware work. There are also small, mom-and-pop retailers that specialize inputting together a hard-disk system to your specific needs. Check with your dealer and see what he suggests. He might not be an advocate of homebrew hard disks, but he might be able to direct you to a good value in a ready-made hard-disk system. Not all Atari computers come with the hard disk external to the computer. Some of the models of the Stacy feature a built-in hard disk. For example, the Stacy 4 ships with a 40MB Conner hard disk built in. If 40 MB isn't enough, then it can be replaced by a higher-capacity drive. Note, though, that doing so will void the warranty on the Stacy. One of the members of my user group installed a 100MB hard disk in his Stacy. He felt the most difficult thing was taking apart the Stacy's case and then re-assembling it. ICD and Supra both have Products that allow you to mount a hard disk inside a Mega ST. Check with ICD and Supra for pricing and availability of these products. Also, the next generation of Atari computers won't have the same limitations as the original did. The new TT computer, and the Mega STE, both come with a hard disk installed. The TT uses the true SCSI standard. If you want a bigger hard disk installed, just flip up the hard-disk portion of the case and put in the 3.5-inch SCSI drive of your choice. The Mega STE is much the same, except that it still has a host adapter mounted internally. You should still be able to replace the built-in hard disk with just about any SCSI 3.5-inch drive. What do I use? Well, I have several systems. I travel a lot as part of my job for Atari. That means a Stacy for demonstrations. I have found the Stacy to be a terrific road warrior. Mine has been knocked over a number of times at airport baggage check-in counters and hasn't suffered a fatal blow yet. At work, I just got a TT030, so I am using the built-in 50MB hard disk.